I have some news to share that some of you already know, but we are expecting our third little one this spring! I am so excited! But, tired! Oh, tired all the time! Hence, the drop in sewing production lately. By the time the boys go to bed I am worn out. Add in some Kindergarten room mom duties, school volunteer stuff, a dog with a torn ACL and basic household stuff and I am barely getting the minimum done around here. But this week I did manage one little finish. I turned this little pile of scraps into a finish. I can't show you exactly what it is yet. I put it in the mail this morning and once it arrives I can fill you in on the rest. I do love the rainbow Heather Ross bits in the centers, but it didn't quite turn out like I thought it would. I think I should have used linen instead of the kona ash, but it was a very time sensitive project and I didn't have as much time to ponder these things. I do hope my recipient likes it! Have a lovely weekend and if you are in the Charlotte area, maybe I'll see you tomorrow at Barnful of Quilts? Saturday 10/6 is the 10th annual Barnful of Quilts in Waxhaw. It will be held from 10-5 at the Fox Family Farm at 7505 Sims Road (704-516-8060). The Charlotte Modern Quilt Guild will have an information booth at the show and several of our members have quilts that will be in the show. The proceeds benefit Samaritan's Purse. Oh it is super cute! I love it. I can't wait to see the whole thing. Sorry you've been feeling so tired. Wish I could help you out with that! Hopefully that 2nd trimester energy will kick in soon. I hope to get to the Barn Quilt thing tomorrow too. Sounds fun! Congrats on the baby! I certainly feel your pain with the tiny amount of time for sewing. I'm often just too exhausted once the kids are in bed and I'm NOT pregnant. The scrappy stars are SO adorable. I love fussy cut, rainbows and heather ross so much! I can't wait to see what it is! Wow! Congrats on the baby coming..I know the baby will be totally awesome and delightful just like you! Yay!!! Congrats and a big hug to you! I am sorry to hear you are pooped but hopefully that will pass soon. During the first tri with my second I would sometimes fall asleep right after dinner! Your fussy cut project is great! I am so curious to see more! Congrats again! Congrats!!!! That is wonderful news about the baby. 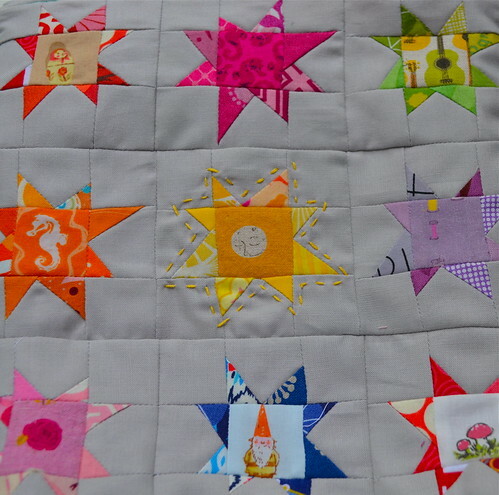 Your star quilt is beautiful and I know your recipient will love it. Your projects are always so cheerful and wonderfully done. Courtney - what wonderful news! Three is a perfect number. My parents had 3, we each married spouses who were from 3-children families, then we each had 3 children! So my niece who now has two little girls is getting a lot of pressure from her cousins to have one more! Haha. And don't feel bad about not being productive. I admire all you young mothers who sew and blog. I did not sew (or do much of anything crafty) until my youngest was 17. 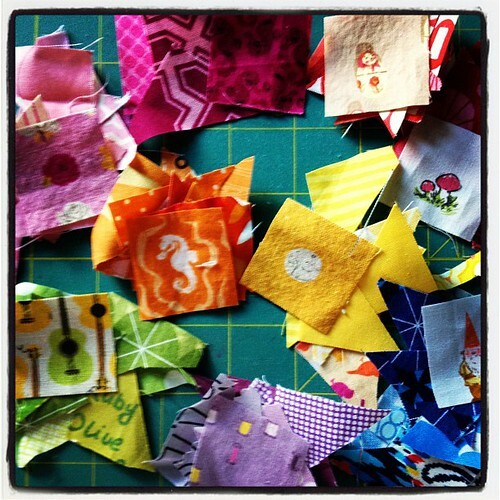 I'm so thrilled that I got to be the first to get a peek of your fussy cut project! It arrived in the mail today and I am in love! Thank you so much for being my angel! You nailed everything that I like. I'm just sorry that you had to do this while you have been so exhausted. Thank you!